Susan on Nutritional Frontiers Holistic Truth Live Radio Show! Susan Merenstein RPh was featured on the Nutritional Frontiers Radio Show! Breaking News: Here’s the Video! Susan Merenstein RPh and Murray Avenue Apothecary were featured on WPXI last night! Our THC-Free LabNaturals PCR Plant Oil products are great for pets and people! Over 75 people came to see Holistic Pharmacist Susan Merenstein speak on Tuesday morning. She spoke to the Parkinson's Foundation of Western PA about the importance of a good diet, the exciting new subject of CBD, and the essential antioxidant and detoxifier Glutathione. 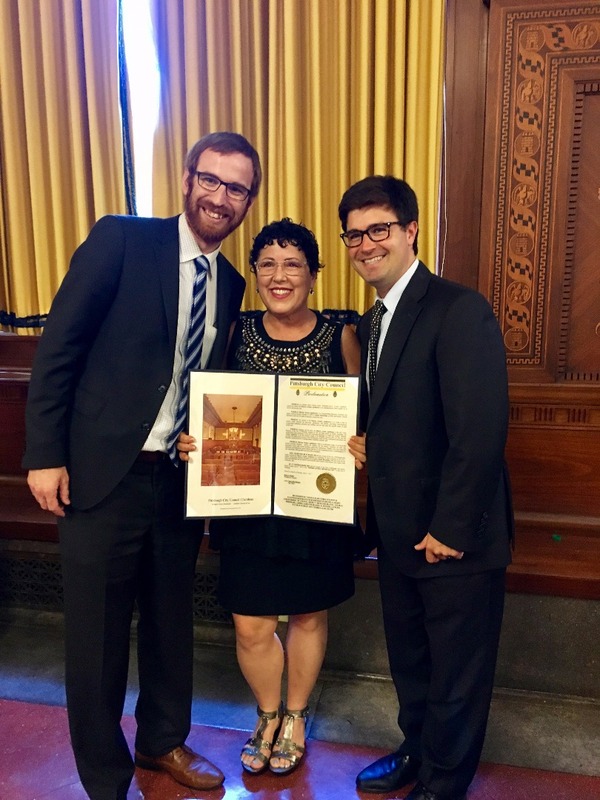 The Pittsburgh City Council issued a special proclamation to Murray Avenue Apothecary and Susan Merenstein, Pharmacist and Owner, on Tuesday June 27th, 2017, officially making that day “Murray Avenue Apothecary Day” in the City of Pittsburgh in recognition of our small woman-owned business serving the community for over 10 years! A special thanks to Councilmen Corey O’Connor and Dan Gilman for making this possible. Murray Avenue Apothecary celebrates 10 Years of Holistic Health and Pharmacy Innovation! On May 10th 2017 Murray Avenue Apothecary celebrated being open for 10 years! 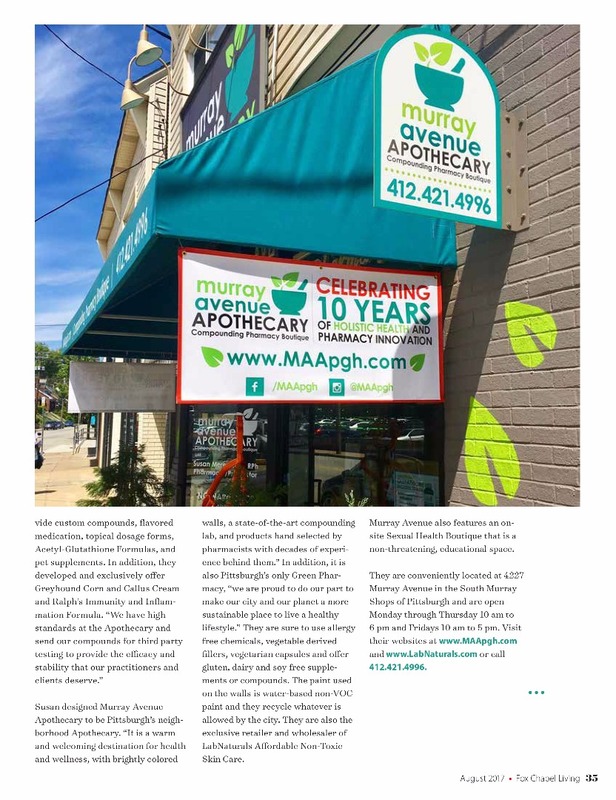 Murray Avenue Apothecary was featured in an article in the Pittsburgh Business Times! Susan Merenstein can remember growing up in her father’s pharmacy, standing on old milk crates to reach the register and eventually working under him as a technician, packaging medication using an old hand-cranked machine. Despite her deep connection to the profession, Merenstein found herself in a midcareer crisis back in 2001 — after years of working in a traditional pharmacy, she had an interaction with a doctor that served as the “wake-up call” that led her to rethink her job entirely. “I was on the phone with this physician,” she said, “and he was prescribing the 17th medication for one of my little old ladies, and it just hit me: What am I doing? How am I impacting health? Do I have any say? This approach includes everything from the type of paint covering its walls to its recyclable prescription vials. Murray Avenue Apothecary specializes in compounding and wellness, with a range of treatments and products for hormone imbalance, sexual health, skin and hair care and nutrition. It also compounds pet medications. Murray Avenue Apothecary is a niche business, part of a growing trend among small pharmacies that have found ways to distinguish themselves from traditional ones increasingly linked to large companies like CVS, Walgreens or Rite Aid. From specialty drugstores that focus on high-cost medications for rare conditions to those that cater to specific populations like correctional facilities, niche pharmacies are fast becoming the norm in a competitive market dominated by big chains. Vanscoy has watched the specialty pharmacy market grow since its infancy. He was involved with Stadtlanders Pharmacy, one of the first specialty pharmacies in the nation in the early 1990s, back when the concept was rare. That approach has worked well for Pantherx, named Pittsburgh’s fastest-growing company last year by the Business Times and one of the 10 fastest-growing companies in the nation, according to Inc. magazine. For Vanscoy, that growth is only going to continue for Pantherx and specialty pharmacies like it in the next few years, fueled by research and an expanding demand for high-cost, specialized drugs. But managing rare drugs or offering complementary homeopathic treatments aren’t the only ways pharmacies are filling niches in the market. Shawn Nairn, owner of Hometown Pharmacy, a traditional pharmacy with two locations in the Pittsburgh area, said not long after he began offering compliance packaging out of his existing pharmacies two years ago, he realized the demand for the service could outstrip his capabilities. That’s why he started a third pharmacy, Carnegie-based Acorx, which works exclusively to create compliance packaging for patient prescriptions. Acorx packages a week’s worth of individual daily doses of medication inside cards printed with dates, dose times and a key that identifies medications contained in the package. Acorx refills the cards and delivers them to patients, creating another layer of security by enabling them to check for missed doses or other issues, Nairn said. “Something like 50 percent of hospital readmissions for seniors are for medicine-related issues — either they didn’t take it at all, or maybe they took it incorrectly, or the dosing was wrong, and these are all things we try to fix to smooth the transition between a person being discharged and being back at home, so they don’t end up back at the hospital,” Nairn said. The impetus for starting Acorx, and the inspiration for its name, Nairn said, was to work with accountable care organizations, voluntary groups of doctors, hospitals and other providers that provide coordinated care for their Medicare patients. The pharmacy, which opened in early March with some existing patients from Hometown’s previous compliance packaging service, also is well-positioned to work with other populations, including behavioral health and homebound patients, Nairn said. “I’ve been doing the compliance packaging out of my two retail stores, and about a year and a half ago, I was fortunate enough to have the foresight to see the value of where this was going and that there was a market for it,” he said. By Lydia Nuzum, Pittsburgh Business Times. Murray Avenue Apothecary has been featured in multiple publications for this month and last month. 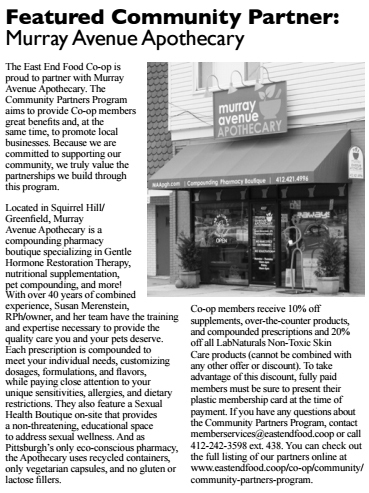 In April, the small business was featured in East End Food Coop newsletter as one of Food Coop's Community Partners. MAA held a special for Food Coop members for the entire month of April stating that if members brought in their card, they would receive 10% off supplements and more. Their April feature can be seen here. MAA is also listed as a Community Partner on East End Food Coop's website at ​www.eastendfood.coop/co-op/community/community-partners-program. 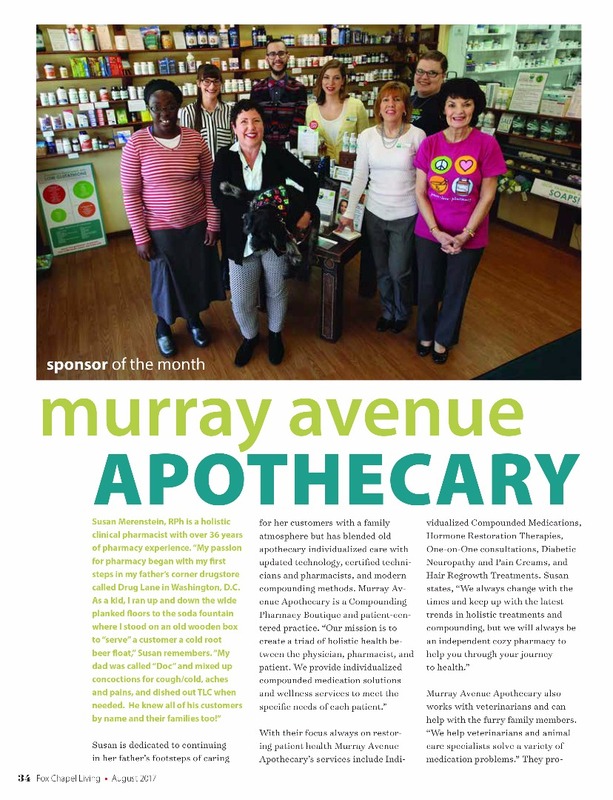 ​This month, Murray Avenue Apothecary was also featured in Fox Chapel Living Magazine as Sponsor of the Month. 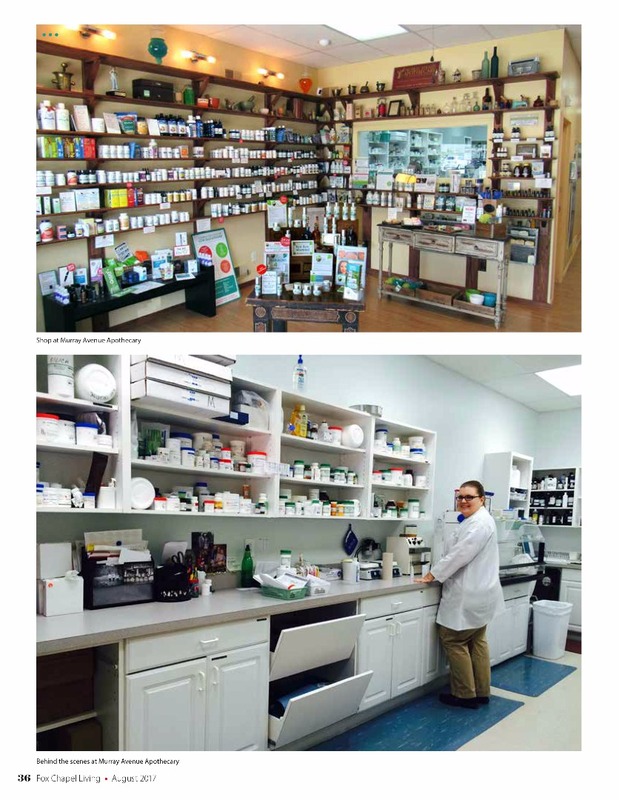 MAA received a two-page spread in the magazine with photos and an entire-page article on MAA and Pharmacist/Owner, Susan Merenstein. Their feature can be seen here. Hillman Integrative Oncology Wellness Fair! We are an integral referral source for Hillman Integrative Oncology doctors to help their patients. We are exclusively invited each year to take part in the prestigious Hillman Integrative Oncology Wellness Fair and we are honored to participate and help doctors help patients. On October 9th Susan Merenstein gave a talk on CBD and Multiple Sclerosis at ERB Physical Therapy. Murray Avenue Apothecary was featured for an article in The Jewish Chronicle! "Compounding Pharmacist Lends Personal Touch to Health, Wellness, Beauty"
Susan Merenstein may not have discovered the Fountain of Youth, but — to borrow a phrase from the film “When Harry Met Sally” — I’ll have what she’s having. At 58, Merenstein, a compounding pharmacist and the owner of Murray Avenue Apothecary, has a flawless complexion, a vivacious personality and, most definitely, a spring in her step. Her youthful aura can be attributed, at least in part, to her own line of skincare products, Lab Naturals, which she developed about 12 years ago and sells in the boutique pharmacy she has operated in Squirrel Hill for the last decade. Her dog, a mutt called Ralph, is another testament to the wondrous concoctions coming out of Murray Avenue Apothecary. He is 17 years old, and though a bit tired, still kicking, which Merenstein says is a result of the pet products that she compounds. Merenstein has pharmacy in her genes. Her late father was a pharmacist in Washington, D.C., where she grew up, and he was a role model for her in a myriad of ways. Merenstein, who earned her degree in pharmacy at the University of Pittsburgh in 1981, worked for many years as a traditional behind-the-counter pharmacist, until she grew weary of counting and cutting pills, yearning to make a bigger impact in people’s lives. As a compounding pharmacist, Merenstein — in consultation with her clients’ physicians — creates individualized treatments to more specifically address each person’s particular needs. Many of her clients come to her to help correct hormone imbalances, that, she says, doctors often do not have the time to adequately address. Human hormones, she said, can be duplicated in the lab, obviating the need for synthetic hormones. “We can replete our depleted hormones with bioidentical or human identical hormones,” according to Merenstein, and those hormones can help treat symptoms of menopause, as well as provide relief for those suffering from menstrual symptoms. Merenstein also focuses on wellness at her pharmacy. In addition to hormone consultation, skincare and pet treatments, Murray Avenue Apothecary also offers a host of other services, including remedies for hair loss. Murray Avenue Apothecary is “unique,” according to Merenstein. Merenstein places a huge emphasis on personalized client consultations. “I tell people to make an appointment to sit down face to face,” she said. Peggy Dayton, another longtime client of Merenstein’s, originally sought her help for menopausal symptoms. In addition to compounding hormones for Dayton, Merenstein also recommended she take vitamin C and D supplements. The cocktail seems to be working. A few doors down from Murray Avenue Apothecary is 20-20 Opticians, the business run by Merenstein’s husband, Barry, and her brother-in-law, Evan Merenstein. But that is only one reason why Merenstein loves going to work. After holding their first DoTerra Essential Oils Event on April 21, 2016, Murray Avenue Apothecary held their second DoTerra Essential Oils Event on Friday, May 13th, 2016 at the Apothecary. Specialists Jacquie Algaier & Dr. Lori Rothschild were at the Apothecary from 12pm to 5pm, educating and demonstrating with DoTerra Essential Oils. Those who participated in the free event received relaxing essential oil hand massages while being educated on essential oils. Snacks and essential oil beverages were also offered at the event. 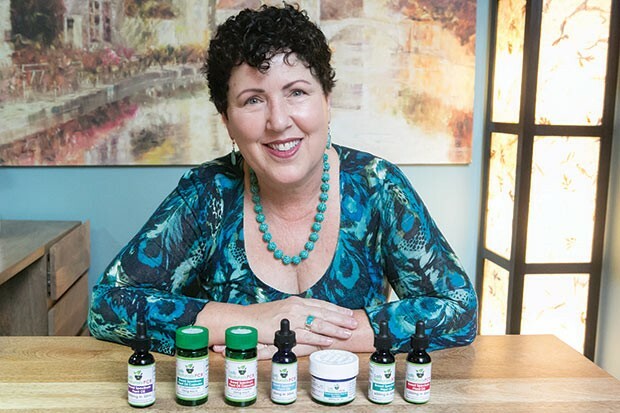 Pharmacist and Owner, Susan Merenstein, hopes to hold more essential oil events to educate the importance and holistic uses of essential oils. Although May 7th was the official day Pharmacist and Owner, Susan Merenstein, opened Murray Avenue Apothecary 9 years ago, the small business decided to hold their official celebration day on Tuesday, May 10th, complete with snacks, giveaways, and a special 10% off store-wide sale for that day only. Merenstein stated that the sale did exceptionally well, and she plans to have more store-wide sales for special holidays/occasions. Susan Merenstein and the staff of Murray Avenue Apothecary are grateful to all who participated in the sale and visited the Apothecary to share the celebration. Murray Avenue Apothecary celebrates 9 years of being Pittsburgh's Only Green Pharmacy and Compounding Boutique. Although the official anniversary is in May, MAA has already started promoting their 9 years of success for the start of Spring and Earth Day in April as well as their Community Partners feature in the Food Co-op's April Issue. They will also be featured in the Fox Chapel Living magazine as Sponsor of the Month which will be released in May. Susan Merenstein, owner of Murray Avenue Apothecary, plans on providing health and wellness to Pittsburgh and beyond for many more years to come. Last week on Friday, December 4th, Murray Avenue Apothecary held their Annual Friends and Family Event. The event took place all day at the Apothecary, ending at 6:30 pm. The day consisted of numerous discounts all over the store, raffles and prizes, and food and beverages. Susan Merenstein, owner of Murray Avenue Apothecary, reported that the day was a success with many people attending the event via RSVP and customer walk-ins. Merenstein hopes that next year's event will be just as successful. 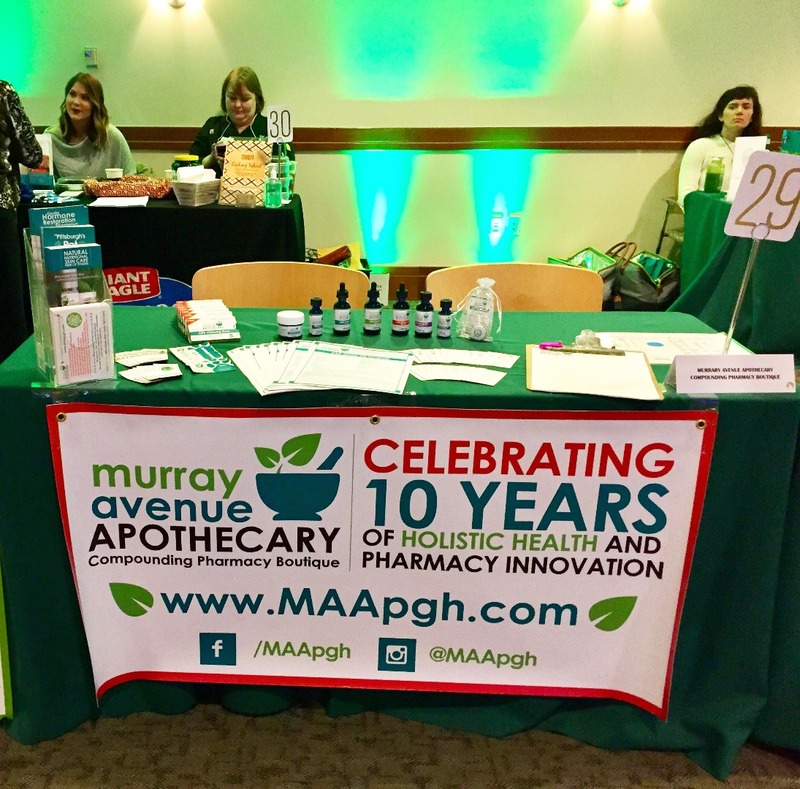 On Sunday, October 18th, Susan Merenstein, Owner of Murray Avenue Apothecary participated at the Naturopathic Medicine and Integrative Care Conference at UPMC. 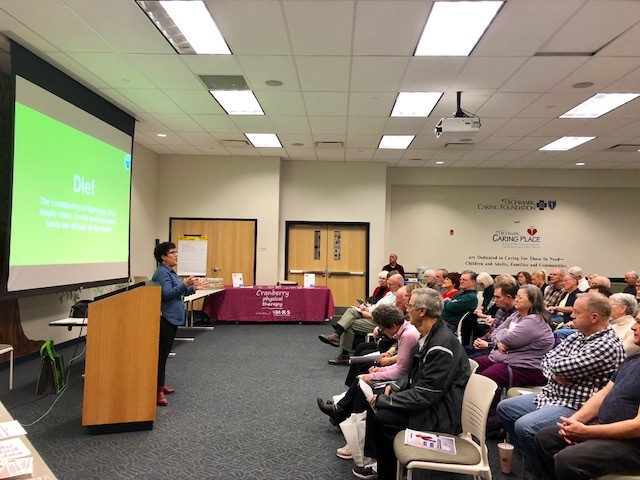 In her presentation on "Hormone Balance and Hormone Testing", Merenstein explained the roles of certain hormones, and how keeping them balanced is essential. One of the main hormones she elaborated on was the Thyroid and Hypothyroidism. Monitoring hormone levels through testing such as Saliva Testing, lifestyle changes, and communication with doctors were also a few of the many topics Merenstein covered to ensure balance of hormones. She stresses that taking a proactive role and educating yourself are key to leading a healthy and balanced life. Susan Merenstein will also be participating in the Hillman Integrative Oncology Wellness Fair on Thursday, October 22nd at Herberman Conference Center at UPMC Cancer Pavilion. In the upcoming issue of Pittsburgh Pet Connection Magazine July/August 2015, Murray Avenue Apothecary features an article dedicated to Digestive Health in Animals. The article explains the importance of probiotics and how they improve animals' digestive health and more, including everything from digestive disturbance warning signs to choosing the right probiotics for your pet. The ad features signature compounded probiotic formulas from MAA including, Animal Digest Formula and Ralph's Immunity & Inflammation Formula which can be purchased on the Pet Compounds page of the website. Click here to view the ad and article in Pittsburgh Pet Connection Magazine July/August 2015 issue. An article published yesterday by Trib Total Media on TribeLive.com documented the Greenfield Bridge Demolition that will be happening this October. In the article, a few local businesses and residents were interviewed, expressing their thoughts. Among them was Susan Merenstein, Pharmacist/Owner of Murray Avenue Apothecary, saying that traffic patterns will greatly be affected, and businesses will stick together. She quoted, "I'll have (promotional) material out for some of the businesses. A lot of these places have really great reputations." That being said, Bridge Closing Specials such as free shipping and more will be something to keep an eye out for at Murray Avenue Apothecary. In celebration of eight years of business, Murray Avenue Apothecary, a woman-owned independent compounding pharmacy which opened in 2007 in the midst of a weakening economy in Pittsburgh’s lower Murray Avenue business district, recently received a matching grant from the Urban Redevelopment Authority of Pittsburgh’s Storefront Renovation Program to revitalize its storefront, including a bright, new awning, a neon sign and a fresh paint job to catch the eyes of pedestrians and motorists in the neighborhood. “This program helps to revitalize and beautify neighborhood business districts like ours- the South Murray Shops as area merchants affectionately call it. I encourage business owners throughout Pittsburgh to take advantage of this resource,” she added. Murray Avenue Apothecary is a compounding and wellness pharmacy located in Pittsburgh’s Greenfield neighborhood at the South Murray Shops. Our mission is to create a triad of holistic health between the physician, pharmacist and patient. We provide individualized compounded medication solutions and wellness services to meet the specific needs of each patient. As Pittsburgh’s only Green pharmacy, we are proud to do our part to make our city and our planet a more sustainable place to live a healthy lifestyle. Murray Avenue Apothecary is happy to announce their sponsorship with Pittsburgh Earth Day 2015. By placing an importance on holistic health and wellness services, Murray Avenue Apothecary has committed themselves to the city and planet, creating a more sustainable place to live a healthy lifestyle. They will be participating in the event at Mellon Square Park on April 22, 2015 with 20% off coupons towards their LabNaturals green, non-toxic skin care and Earth Day themed magnets. 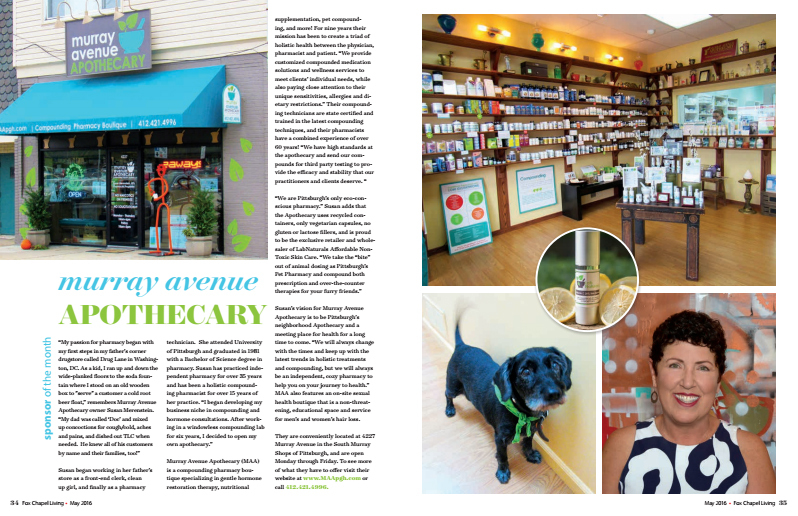 The featured business in this month's issue of Pittsburgh PetConnection Magazine is Murray Avenue Apothecary and their services for pets. The article talks about Vet Compounding and how many veterinarians nowadays are turning to compounded medications much like what Murray Avenue Apothecary does. The article also features Acetyl-Glutathione, compounded exclusively at Murray Avenue Apothecary, and its uses and benefits for animals. To view the full article feature on pages 11 and 12, click here. Murray Avenue Apothecary recently held an event on March 9th to raise awareness for Premarin Horses in which they raised nearly $1,000. Those proceeds went to Dreamchasers Horse Rescue & Rehabilitation, where most of the horses there are rescued from the horrid treatments they faced at the Premarin Farms. Premarin, (PREgnant MARes urINe) is one of the top selling hormonal drugs for women in the country. Even though millions of women take this billion dollar drug every day, most are unaware of its deadly side effects such as cancer, heart attack, blood clots, and stroke. Most women who take Premarin are also unaware of the horrific pain horses suffer in Pfizer’s urine farms including imprisonment, dirty feedlots, slaughterhouses, water deprivation, the butcher of 900,000 baby foals, and more. Dreamchaser PMU Horse Rescue & Rehabilitation was initially created to rescue mares and foals that were discarded by the Premarin drug industry. Since their inception, they have evolved to also rescue horses from neglect, abuse, abandonment and slaughter. They have taken in many animals since 2002, gentled, trained and re-homed as many as possible into qualified homes. The majority of their horses are totally wild (untouched by humans) when they arrive. They are one of the few facilities that can gentle and train a wild horse using common sense, time, gentleness, and patience. The average length of time a rescued horse spends at the ranch is one year.